new birth – God's Grace ~ God's Glory! Everyone who comes into this world is “born for adversity.” God’s children are born for contentment. Years ago, when our oldest granddaughter started elementary school, I asked her why children were going to school every day. Her reply was, “So that we can get a job, make money, and buy what we want.” She was learning well at an early age what the world teaches about contentment. Now, at the age of twenty-four she is married, has a two-year old daughter and a job. And through adversity, she is learning to be content with what she has. In this world of oppression, we are taught that we have the power to accomplish whatever makes us happy. This is not the contentment for which God’s people are born. Let’s leave behind the fallacy that we are responsible for our own contentment. True contentment ~ divine contentment ~ comes to us by the supernatural power of God, our heavenly Father. He desired us and sired us for His own pleasure and contentment. Just as we learn from infancy how to survive physically, we must learn, at His feet, how to be content in this world of oppression. We are reminded of the apostle Paul’s words, “ I have learned…..to be content.” (Philippians 4:11) What God gives us in our new birth is a new heart, and a new spirit with a desire for that which is eternal. The new birth is the spring. Growing by the grace and knowledge of our Lord Jesus Christ brings the blessings of His presence and power, blessings we cannot fathom, or control, at times carrying us away with the flow. Divine contentment is the opposite end of the spectrum from oppression, as far as heaven is from the earth. Between oppression and divine contentment, the reality of adversity remains part of every person’s life. Divine contentment is God’s blessing and gift of grace, that His children may live content in Christ, in the middle of adversity. It is more than just having what we think we need, but receiving what He has so graciously prepared for us ~ more than we could ask or think. As we continue to proclaim the legacy of God’s kingdom we will share what He is teaching us of this supernatural, phenomenal gift of His contentment. Dear Father in heaven, many ask why you allow oppression and adversity. Keep us close to you as we are learning your thoughts and your ways concerning our place in your kingdom here on earth. We praise you for the contentment that is ours in Christ, for the legacy that is ours as joint-heirs with Christ now and for eternity. Show us your ways O Lord; teach us your paths; lead us in your truth and teach us. For Thou art the God of our salvation. On Thee do we wait all the day. In Jesus’ name we pray. Amen. How the photographer got this close to the scene I do not understand. I only know what I see in the picture. And it reminds me of the words of the Psalmist who experienced the wings of God’s grace. It also reminds me of the need for stronger and larger wings as we grow in the grace and knowledge of our Lord Jesus Christ. In Waiting on God, Andrew Murray aptly describes the work of God’s grace in us. “You know what eagles’ wings mean. The eagle is the king of birds; it soars the highest into the heavens. Believers are to live a heavenly life, in the very presence and love and joy of God. They are to live where God lives; they need God’s strength to rise there. It will be given to them that wait on Him. You know how the eagles’ wings are obtained. Only in one way — by the eagle birth. You are born of God. You have the eagles’ wings. You may not have known it; you may not have used them; but God can and will teach you how to use them. You know how the eagles are taught the use of their wings. See yonder cliff rising a thousand feet out of the sea. See high up a ledge on the rock, where there is an eagle’s nest with its treasure of two young eaglets. See the mother bird come and stir up her nest, and with her beak push the timid birds over the precipice. See how they flutter and fall and sink toward the depth. See now how she “fluttereth over her young, spreadeth abroad her wings, taketh them, beareth them on her wings: (Deuteronomy 32:11), and so, as they ride upon her wings, brings them to a place of safety. And so, she does once and again, each time casting them out over the precipice, and then again taking and carrying them. “So the Lord alone did lead him.” Yes, the instinct of that eagle mother was God’s gift, a single ray of that love in which the Almighty trains His people to mount as on eagles’ wings. He stirs up your nest. He disappoints your hopes. He brings down your confidence. He makes you fear and tremble, as all your strength fails, and you feel utterly weary and helpless. And, all the while He is spreading His strong wings for you to rest your weakness on, and offering His everlasting Creator-strength to work in you. And all He asks is that you sink down in your weariness and wait on Him. 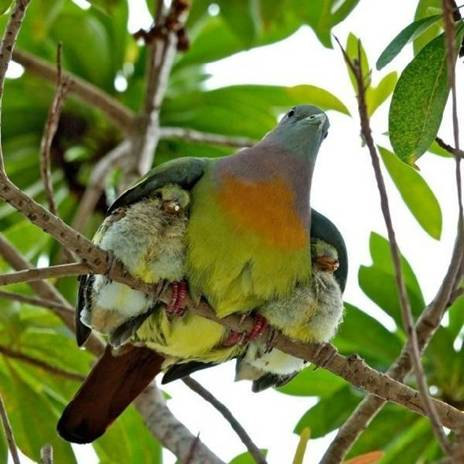 Allow Him in His Jehovah-strength to carry you as you ride upon the wings of HIs omnipotence.